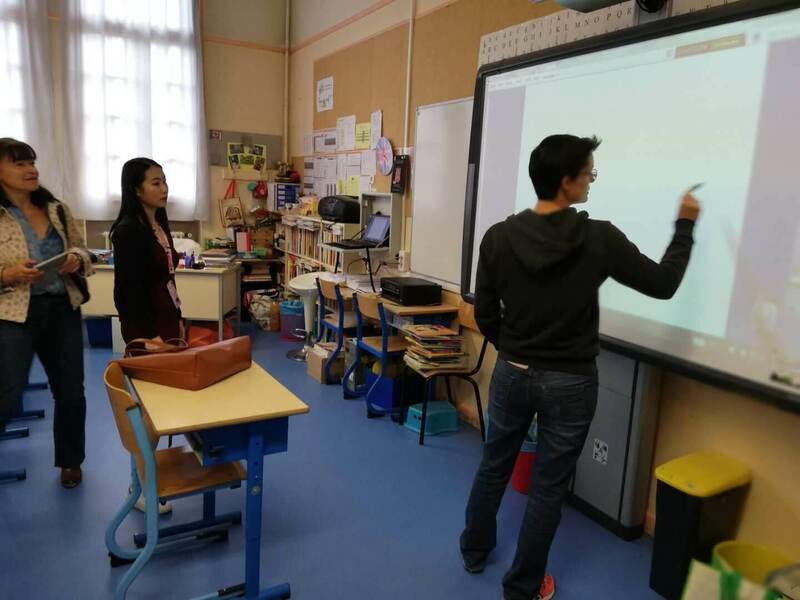 I am Miss Mandarin, a Chinese teacher working in France I had taught Chinese to kids from Chinese immigrants’ families or French families via traditional textbooks and traditional methods in weekend Chinese schools, which is what most Chinese language teachers do. Honestly, I got a bit fed up with what I’m doing, struggling to something inspire and be interesting. Things got to change after one year I joined HIHILULU, I got on board with a pilot project of Immersion Chinese for kids from non-Chinese families. HIHILULU creates a special program based on its immersion Chinese system for this pilot project. It is supported by the education department of local government and local French teachers in a French public primary school. The Pasteur Primary School, one of the twelve elementary schools in the city of Deuil-la-Barre, is our first public school partner in France. Located in the northern suburbs of Paris, Pasteur school has opened the door of Class CM2(equal to K5) to hihilulu pilot project. In the next 6 months, I will work with the principle teacher of the class with 29 students aged 10-11 years old! According to the pilot curriculum, there will be 22 weekly courses between one to two hours, during which students need to learn 3-5 keywords or expressions. The pilot program is composed of theme-based courses in line with level program on hihilulu immersion Chinese platform and culture exploration workshops. Leveraging the quality, contents and blended methods provided by hihilulu, this pilot program will give children, who have no knowledge about Chinese easy access to this tonal language and its exciting culture. January 11th, 2019 was my first meeting with my French students. I wrote a simple self-introduction to those non-Chinese speaking students. I needed to explain what we are going to do in the next six months, how to do and what HIHILULU could bring to them during the pilot program in and out of the classroom. Well, the purpose of this project is to help these students learn Chinese in a natural way and I will use no French or as little French as needed. I plan to find cool Chinese names for my 29 students. A Chinese name contains pleasing sound, tonal qualities as well as bears positive and beautiful meanings. Each character used not only has its original idea, but often has its hidden meanings. That is one of the reasons that Chinese is different from other languages. I expect to raise up my students’ interest in Chinese by firstly giving them a Chinese “identity”. With excitement, I met my French students. In this French public elementary school, the classroom was equipped with a projector and a laptop. Since the school couldn’t assign each student a tablet, I brought two tablets to show the students how HIHILULU works on the tablet. Students easily found the one-stop content and played the interactive practice of listening, speaking, reading and writing. The French principle teacher printed out the downloadable flashcards on our website in advance, and distributed to students to do exercise after watching the animation and related digital contents. It was the first day, the first time and the first meeting! Those children, they knew nothing about Chinese! Excited, a bit nervous, I started with the simplest self-introduction. From the very first moment entering the classroom, my new students kept raising their hands and asking questions, which made me, feel right away the enthusiasm of these students. After my briefing, I showed them an animated cartoon of "Patrol Cars". Although the cartoon is in Chinese dubbing and no French subtitles, the students could understand and tell the story (in French at least for now), enthusiastically after watching the cartoon. That is extremely encouraging. Then I helped each of them to translate their name into Chinese. Although the planned process of giving them Chinese names with specific meanings was simplified to translate their names according to pronunciation with corresponding positive meanings, the students’ enthusiasm was not reduced. They followed me repeating the pronunciation of their names again and again, and then imitated the writing on paper. They eagerly came up to ask me to check whether the Chinese characters they wrote were correct or not. I felt it was really a good start, for them, as well as for me. What happened during the break was even more amazing! Girls from other classes came to see me, surrounded me and asked me if I can get them a Chinese name. They are also curious about how to speak Chinese. While one of the girls learned that I’m the Chinese teacher for the CM2 class this year, she asked " Why don't we have the workshop? Will you teach us next year?" It was beyond my expectation. The students' curiosity and interest in Chinese made me very happy and began to look forward to the next pilot course. Returned to the classroom after the break, at the request of my students, I taught them one word of “greeting”, which was actually prepared for the third lesson. They watched the HIHILULU WordWorld Flashcard video, and with my help, they practiced speaking and writing the words: “Nihao” (你好) – hello! During this first class, positive reactions from those French children were beyond my imagination. They are looking forward to using their accounts on hihilulu, and I am very looking forward to seeing them next week!